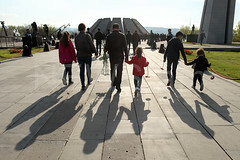 The events of 27 October 1999 were organized by a foreign country and perpetrated through the Armenians. This is what former speaker of the National Assembly, former MP and member of the Republican Party of Armenia (RPA) Galust Sahakyan said today at Yerablour Military Pantheon. “The events of 27 October 1999 were one of the darkest pages in the history of the Armenians because people wanted to break the government down immediately for no reason. It was a measure that was taken and it had consequences on the overall development of our country many years later,” Sahakyan said. After all these years, people declare that there were people who ordered these events. In response to this, Sahakyan said the following: “I am asked that question every year, and every year I say that I believe the events were organized by a foreign country and perpetrated through the Armenians.” However, Sahakyan had trouble saying which country organized the events. On 27 October 1999 at around 17:00, during the regular question-and-answer session of the parliament and government officials at the National Assembly, gunmen invaded the session hall and opened fire at Speaker of the National Assembly of the Republic of Armenia Karen Demirtchyan and Prime Minister Vazgen Sargsyan. The gunmen were Nairi Hunanyan, Karen Hunanyan, Eduard Grigoryan, Vram Galstyan and Derenik Bejanyan. 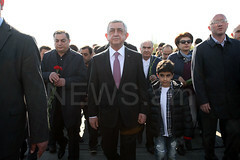 The victims were Speaker of the National Assembly Karen Demirtchyan, Prime Minister Vazgen Sargsyan, Deputy Speakers of the National Assembly Ruben Miroyan and Yuri Bakhshyan, Minister for Operative Issues Leonard Petrosyan and MPs Armenak Armenakyan, Henrik Abrahamyan and Mikayel Kotanyan.